Happy Monday friends!! With the 4th landing on a Tuesday this year, I feel like the weekend festivities lasted all week long. Yesterday we relaxed around the house, watching movies in the AC and I feel ready to take on the week!! Speaking of this week, do you know what starts this Thursday?! The Nordstrom Anniversary sale! 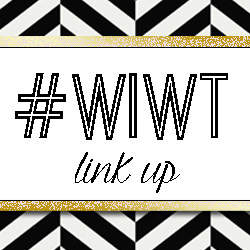 Check out my post with all of the details here! If your looking for the perfect summer date night outfit, check out this fab romper from Purple Door Boutique. I was automatically drawn to the bright floral print, but the ruffles definitely sold me! I love fun pieces like this that require minimal accessorizing and can be dressed up or down. 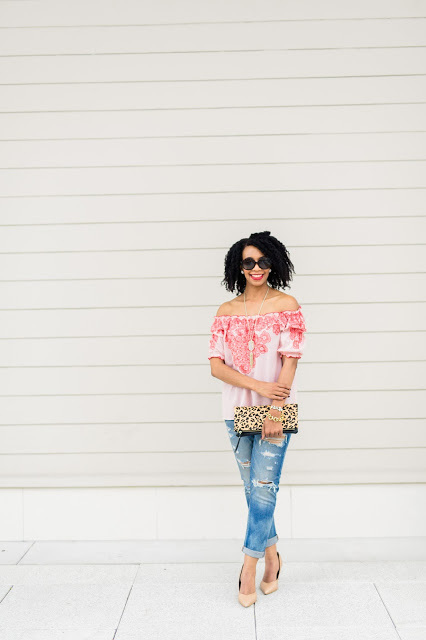 I wore this for a relaxed date night with my favorite sandals and summer clutch. It’s the perfect airy piece for hot summer nights! Nothing screams summer like a fabulous tropical print! What’s even better? 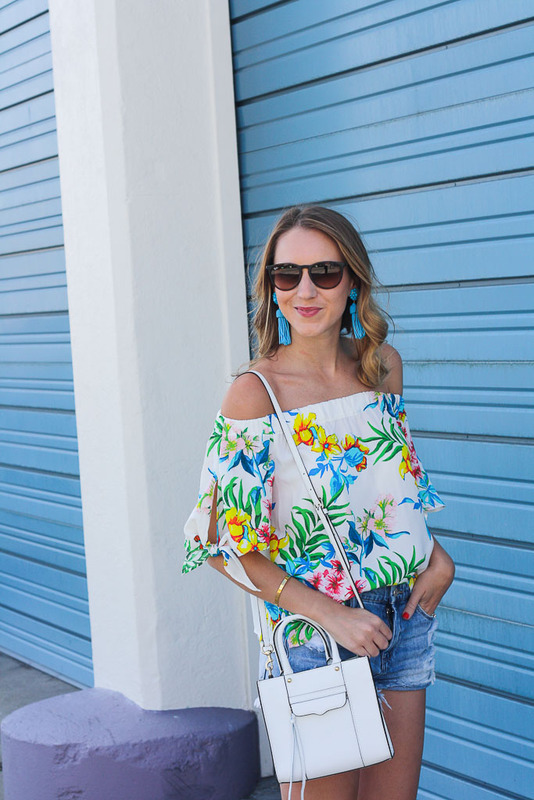 An OFF THE SHOULDER tropical print top. This top from The Purple Door Boutique is a summer must have! Throw it on with jeans or distressed cutoffs and you have the perfect outfit for a bbq or a date night! This is one of those pieces that is perfect for vacation too! This will be the first thing I pack if I head somewhere tropical anytime soon! Pick this sweet top up today for just $32! Don’t Forget! Enter to win a $1,225 Nordstrom Gift Card HERE! Nothing screams summer like a fabulous pineapple print, which makes this dress from the Purple Door Boutique perfect for the upcoming season! From the vibrant mint to the adorable pineapple and flower print, this dress is a piece that will be on repeat all summer long! Whether you are heading on a vacation (would this dress not be perfect for Hawaii?) or just looking for a piece to throw on on a hot summer day, you need this sweet dress in your closet! The best part? It’s under $50! A bargain considering similar dresses (see my favorite, linked below) go for as much as $140! 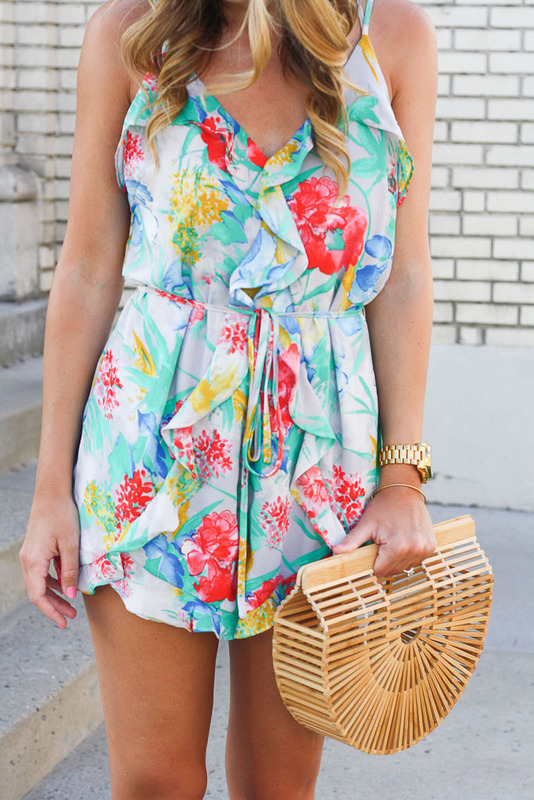 There is also a romper in this print that’s equally as cute! If you are looking for the perfect summer piece, check out the Purple Door Boutique’s Island Daze collection! SO many vibrant, fun pieces that are perfect for summer! This weeks featured blogger is.. Moody Girl In Style! Contagious smile, accessories on point, and such an amazing outfit! !